The three hairpin settings in the Basic edition are on the Alignment and the Optimize tab. The Perfect Layout plug-in differentiates between the actual end connection of a "hairpin over the barline" and the visual connection. b) to the end of the previous measure. Solution a) is optimized for playback, but has the drawback that hairpins over systems can't be separated from the end of system barline. Solution b) is visually optimized, but doesn't work fully optimized with Finale's cresc./diminuendo playback. In solution b) the hairpins ALWAYS end before the barline. If solution a) is selected, it's possible to specify where the hairpins should visually end: to avoid/allow collisions with the barline. This selection can be made for the parts, for the score and for piano (two staff) groups. Image 1 lists a view options. 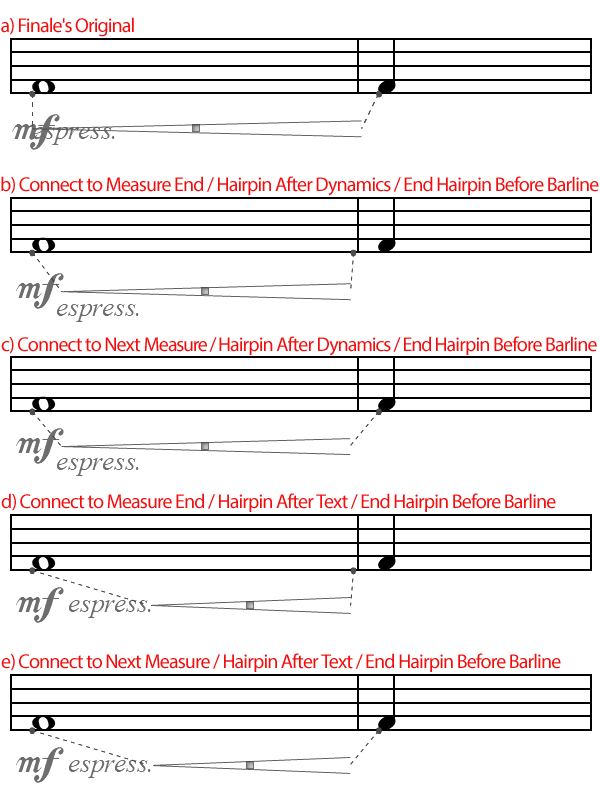 Hairpins can either start directly after a starting dynamics or after the expressive text expression (see image 2). Option: "Move Hairpins on Dynamics with Express. Text After Dynamics/After Expressive Text". Expressive text expressions that start somewhere in the middle of the hairpin are moved below the hairpin (e.g. 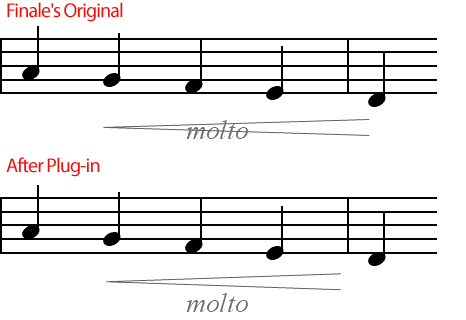 "molto" in image 3). If hairpins are connected on a measure position, you can specify the gap between them (Option: "Gap Between Connected Hairpins"). 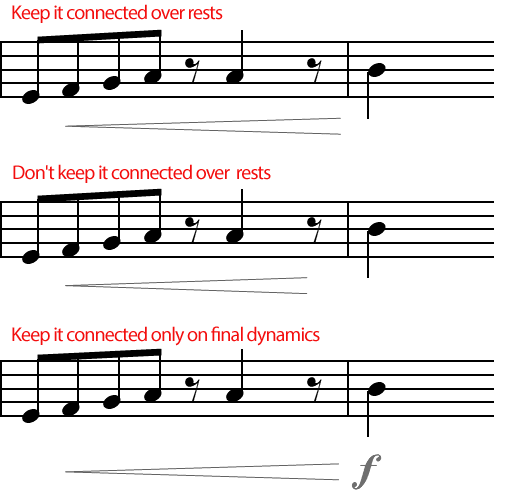 If a hairpin is connected over a rest to an end note, it's possible to keep it or to have it reduced to the end of the previous note (see image 5). It's also possible to only keep it, if it is connected to a final dynamic expression (image 5c). The same option is available for start notes. 5.) Hairpin Start/End Offset and "Snap to Note"
The exact start and end offset of an hairpin on a note or a rest is automatically calculated by the plug-in (see image 6). If the start/end of the hairpin is further away from the next note, it depends on the context whether the plug-in snaps the hairpin to the closest note. Only if the plug-in is sure that this is what was originally intended and if "Allow Snap To Closest Note, Rest or End of Measure" is checked, then it might snap. The plug-in takes into account the horizontal distance between the objects, dynamics and also hairpins on other staves in the same measure, so that, if possible, all hairpin are treated equally. In doubt the hairpin will not be changed. So when entering the hairpin, it is best to not create ambiguous layouts as in image 7. Image 7: Where should the hairpin end on the left image? On beat 3, 4 or even on beat 1 of the next measure? On the right image it's obvious. Note: Finale has a problem with the end of the closed side of a hairpin on screen which doesn't match the end position of the hairpin in print (PDF or paper). The plug-in takes this into account and always calculates the offsets for print only. I.e. should there still be a collision of a hairpin with a dynamic on-screen, do a print to PDF or paper first to check if it isn't that bug. Only in very rare cases the plug-in doesn't solve this bug. a) the vertical position of a hairpin in relation to a connected dynamic is set in "Center of Dyn. Expression" (13 EVPU by default on a hairpin opening width of 28 EVPU). b) On very low notes it's possible to have hairpins closer to slurs and ties to save space (Option: "Slur/Tie (Very Low Notes)"). The threshold for very low notes is set in the field below ("Very Low Note Threshold", 80 EVPU by default, i.e. ca. 3 ledger lines below the staff).